Republican Terry Branstad has won the Iowa G.O.P.’s 2010 nomination for governor and he spoke to supporters in Des Moines shortly before 11 o’clock Tuesday night. “Iowa Republicans have decided that our state is ready for a comeback and I’m ready to lead that change,” Branstad said. 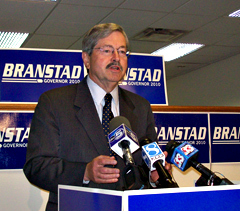 Branstad promised “honest, open and scandal-free government” if he’s elected to a fifth term. “We did it before and we can do it again,” he said, to cheers and applause from his supporters. 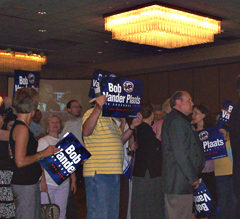 Bob Vander Plaats, one of the two men who challenged Branstad for the G.O.P. nomination for governor, spoke with his supporters about 15 minutes earlier, saying Tuesday night wasn’t the time for “raving endorsements.” Vander Plaats said he had talked by phone with Branstad Tuesday night. “What we’ve agreed to do is to sit down and to discuss our differences — get them all out on the table — so that it is our hope and my goal to unify a state around leadership that the State of Iowa desperately needs,” Vander Plaats said. Some of Vander Plaats’ supporters have said they will not support Branstad in the fall election. Rod Roberts, the third candidate in the Republican race for governor, delivered a concession speech earlier Tuesday evening, saying he had no regrets. Roxanne Conlin talks to supporters after her primary win. Roxanne Conlin won the Democratic Party’s nomination for the U.S. Senate in Tuesday’s voting. She spoke to cheering supporters shortly before 10 o’clock Tuesday evening, saying it was time to break the “glass ceiling” in Iowa politics as Iowa has never elected a woman to the U.S. Senate, to congress or as governor. She will face Republican Chuck Grassley, Iowa’s long-time U.S. Senator, in the fall election. Brad Zaun of Urbandale won the Republican Party’s nomination for Iowa’s third district congressional seat, winning in a seven-person race. Zaun will face Democratic Congressman Leonard Boswell of Mount Vernon in November. There were four Republican candidates in the second congressional district and Mariannette Miller-Meeks of Ottumwa won the nomination for the second time. Miller-Meeks will face Democratic Congressman Dave Loebsack of Mount Vernon in a November rematch. In Iowa’s first congressional district, Benjamin Lange of Independence is the winner, defeating three other Republicans who were on the Primary ballot. 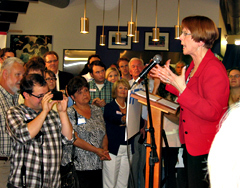 Lange will face Democratic Congressman Bruce Braley of Waterloo on the General Election ballot. Democrat Matt Campbell of Manning won the Primary in the fifth congressional district. He’ll face Republican Congressman Steve King in November. There were two other statewide primaries on Tuesday. Dave Jamison, the Story County Treasurer, won the Republican Party’s nomination for State Treasurer. Matt Schultz, a member of the Council Bluffs City Council, won the Republican nomination for Secretary of State, beating two other G.O.P. competitors.